I am not sure what HP is going to think of this article if they see it but there is no laws against me offering my opinion, so please note this is all this article is. My own opinion. Recently I had the misfortune of having to deal with a HP C4599 AIO printer. In my favour I have been doing this sort of thing for almost 5 years now and I could not, for the life of me, get this hell-spawned printer to work correctly. I eventually got it to print (occassionally) but the scan function was useless. I was attempting the setup on a 64-bit Windows 7 machine. I ended up trying it on a Windows 7 32-bit machine and a Windows Vista 32-bit machine with the same results. The printer troubleshooting guide is an absolute joke which consists almost entirely of “turn it off and on again” advice. On HP’s website there is a firmware upgrade which is listed as critical. It supposedly stops the printer from falling into an unresponsive state. On the support forum I read that this update fixed a lot of peoples issues but after attempting to install the firmware update from three different computers running three different operating systems, across LAN and across wireless I eventually gave up. The update simply would not work. The error message told me that the device was not connected. I also went so far as to bring the printer in to work and attempt to update it on an older Windows XP system without success. There was also a few people that somehow managed to get HP to replace their faulty printers upon contacting HP’s technical support. Unfortunately when I tried that I was informed that the printer was out of warranty, which was true as I was fixing it for a client who had bought it a while ago, tried to set it up and gave up; leaving it in his cupboard non-operational for quite some time. Even though I only dealt with the C4599 from what I can tell from reading about other people’s experiences the same issues also plague the C44xx and C45xx series of printers. 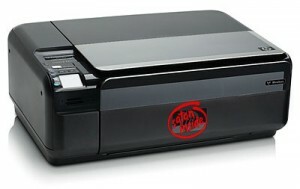 So unless you love wasting your money on things that don’t work properly do not buy this printer. Read this instead. If anyone has any advice on fixing this god forsaken piece of hardware please let me know by leaving a comment. Next Next post: DVI & VGA – What is the difference?